6° have completed the training provided for by this law. Article 2 - Former avocats-défenseurs and avocats called to the Monaco Bar, who have been practising for at least five years, are exempt from a training period. Lawyers called to a foreign Bar, who have been practising for at least ten years, may also be exempt from a training period by the Directeur des Services judiciaires** after recommendation from the Monaco Bar Association. Article 3 - Only a person who has passed the examination regarding the capacities and knowledge required to practise as a lawyer may be admitted to become a trainee lawyer as provided for by article 1 n° 6. Admission as a trainee lawyer shall be pronounced by an order of the Directeur des Services judiciaires. Article 4 - The training period shall last three years. Upon decision of the Directeur des Services judiciaires, the training period may: 1° either be extended for a period of one year or for two periods of one year, after recommendation from the committee of the Bar, once the trainee lawyer has been heard or duly been called; or 2° exceptionally be reduced to two years or to one year, after recommendation from the committee of the Bar, should the trainee be over thirty and give evidence of having practised law for more than ten years with an avocat-défenseur and avocat. Article 5 - If the result of the recommendations pursuant to the following article shows that the trainee lawyer has succeeded in the training period, he or she will be admitted to practise law as an avocat. Otherwise, the trainee period will cease by an order giving reason made by the Director of the Bar. Article 6 - Avocats admitted to practise law are appointed by an order of the Directeur des Services judiciaires issued after recommendation from the First presiding judge of the Court of Appeal, from the Public Prosecutor, from the Presiding judge of the Court of First Instance and from the committee of the Bar. Article 7 - An avocat of the Monaco Bar who has practised law for five years may apply for admission to practise as an avocat-défenseur, if he or she is at least thirty years old. The five year period is reduced to two years for an avocat who has been exempted from training according to article 2. Should there be fewer than five avocats-défenseurs, the most experienced lawyer, and in case of the same period of service, the eldest one may, if he or she is at least thirty years old, apply for admission to practise as an avocat-défenseur even if he or she has not practised law for five years as a lawyer of the Monaco Bar. In any case, a lawyer shall not be admitted to practise law if the result of the report and the recommendations pursuant to the following article do not show that his or her law practice is sufficient or satisfactory. Article 8 - Avocats-défenseurs who are admitted to practise law are appointed by Sovereign Order upon a report made by the Directeur des Services judiciaires after recommendation from the Presiding judge of the Court of First Instance and from the committee of the Bar. Article 9 - No one may practise law, if he or she has not sworn the following oath before the Court of Appeal: "I swear faith to the Prince and adherence to the laws of the Principality of Monaco; I swear that during the exercise of my profession I shall not say or write anything contrary to the laws, to public policy and to public peace and I shall comply with the dignity of the existing courts, judges and authorities through my intentions." 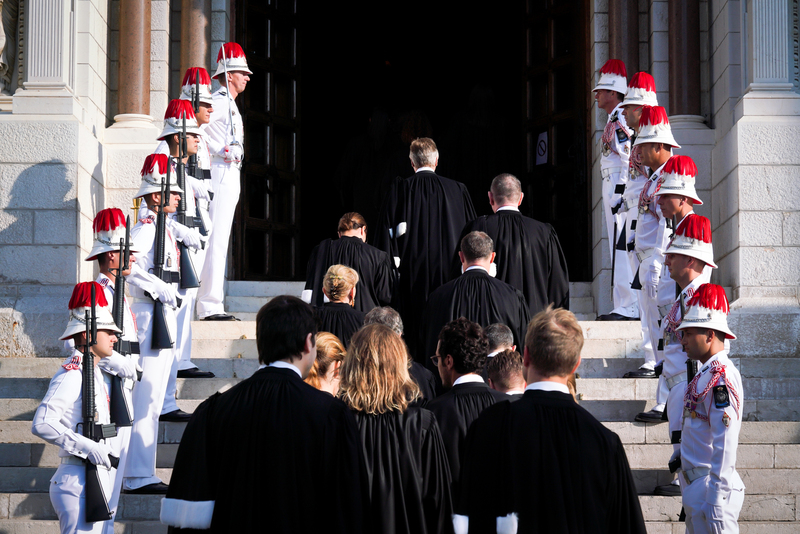 Article 10 - The avocats-défenseurs, the avocats and the trainees make up the Monaco Bar of avocats-défenseurs and avocats of the Court of Appeal of Monaco. The Bar has legal status. The Bar holds a general meeting at least once a year. Article 11 - The Bar is managed by a board consisting of a chairman called the President of the Bar and of two avocats-défenseurs or avocats elected by the general meeting. The President of the Bar represents the Bar in current civil matters. The powers to do so are granted for a period of one year and are renewable; however, the President of the Bar cannot hold his office for more than two successive years. Elections take place by ballot by absolute majority in the first vote and by relative majority in the second vote; where there is an equal number of votes the eldest candidate in practice is declared to be elected. Trainee lawyers are neither voters nor eligible. 5° to defend the profession of avocats-défenseurs and avocats. Article 13 - After hearing the President of the Bar, the First presiding judge of the Court of Appeal and the Public Prosecutor make a list of the Bar at the beginning of each judicial / court year. The list shows only the name, first name and address of each of the members in order of the admission dates. It is divided into three parts: avocats-défenseurs, avocats and trainee lawyers. Article 14 - Avocats-défenseurs and avocats are representatives of the law. They offer their services for the defence of interests referred to them with integrity. They must accomplish their task with dignity, conscientiousness and integrity. Article 15 - Unless otherwise provided for by the law, trainee lawyers have the same rights and are subject to the same duties as the avocats. Article 16 - The profession of avocats-défenseurs and avocats is inconsistent with: 1° the duties of a notary, bailiff and trustee in bankruptcy; 2° the duties of an administrator, director, manager or agent of a trade company; 3° the duties of a director, chief editor or manager of a newspaper or a periodical; 4° acting as an employee; 5° the profession of a business agent; 6° any other independent, industrial or commercial work, except teaching; 7° any activity affecting the independence of the person concerned or the independency of the profession. Avocats-défenseurs and avocats may manage his or her family business with the approval of the committee of the Bar, except if exercising, even indirectly, any business while dealing with such management. Article 17 - Avocats-défenseurs have the capacity to represent the parties and to address final pleadings to any courts. Avocats have the capacity to address final pleadings to any courts and to represent the parties before the criminal courts, the justice of the peace, the labour court and in any other cases provided for by the law. Trainee lawyers have the capacity to address final pleadings to any courts, except the Supreme Court and the High Court of Appeal. They cannot represent the parties. During their practice, they wear their gown. Article 18 - Only avocats-défenseurs are authorised to proceed with payments in cash directly related to their professional activity while representing or assisting a person, subject to any evidence of a special power of attorney in case it is requested. Article 19 - The parties may, in any matter, ask a lawyer called to a foreign bar to assume the defence of their case. Such lawyer must have been previously authorised to address final pleadings to the court by the presiding judge of the court referred to. Such authorisation is always subject to assistance by an avocat-défenseur as to the proceedings and the preparation of written pleadings, except for the defence of a defendant person in criminal cases. Article 20 - Avocats-défenseurs are obliged to follow on a regular basis cases conferred to them at different hearings, according to any suspensions or postponements ordered by the court in question until final judgment has been issued and enforced. They have the right to withdraw their services if they think it necessary. In such case, withdrawal takes place only once they have been replaced by another avocat-défenseur chosen by the client or if no avocat-défenseur accepts the case, one shall be appointed in accordance with the provisions of the following article. Article 21 - If in civil matters no avocat-défenseur, nor avocat agrees to represent a party, the presiding judge of the court to decide on the matter shall appoint one officially. During any hearing before the Supreme Court and the High Court of Appeal, such powers shall be conferred to the First presiding judge of the Court of Appeal. The avocat-défenseur or avocat thus appointed shall be entitled to the same fees as if he or she had been chosen by the party. Article 22 - In their final and written pleadings for the purpose of being produced before the court, avocats-défenseurs and avocats are forbidden: 1° to make any attacks against the principles of sovereignty and the laws of the Principality of Monaco; 2° to show a lack of respect towards or consideration for the judges. Article 23 - Avocats-défenseurs and avocats are not allowed to make statements concerning the honour or reputation of the parties, except if required by the case and if they have received special instructions in writing by their clients. The court to which the case is referred may order the withdrawal of any such offensive letters or libels. Article 24 - Costs and fees due to avocats-défenseurs are paid in accordance with the prevailing rates. Avocats-défenseurs, who have received payment of their legal costs, may ask the clerk of the court to forward an enforceable extract of the judgment pronouncing such payment; the legal costs shall be paid against the opposing party as well as against their own client, if the latter has been sentenced. Article 25 - If necessary, avocats-défenseurs have the right to claim fees for efforts and care outside their fees for being strictly instructed as lawyer as well as fees for advice, final pleadings and other professional diligence without fixed rates. They do fix the amount themselves. Avocats fix their own fees for advice and final pleadings. Avocats-défenseurs and avocats are not allowed to claim any part of the litigious object or the amount of the sentence as a reward for their work. Article 26 - Avocats-défenseurs and avocats appointed for matters requiring legal aid, in accordance with article 48 of the Monaco Code of Civil Procedure, are not allowed to ask for fees, nor may they accept them if so offered. However, they may ask for fees with the authorisation of the committee of the Bar if the sentence pronounced against the opposing party has provided the party they are assisting or representing with such means that had such means existed when legal aid was granted, it would not have been granted. Article 27 - In case of dispute in respect of the application of the rate of costs and fees, the amount of fees or the application of the provisions of article 26, there shall be a reconciliation attempt before the President of the Bar, who is informed by simple letter. In case of non reconciliation, the Presiding judge of the court dealing with the matter shall decide. However, the presiding judge of the Court of First Instance is competent if the matter is referred to the justice of the peace. He or she is also competent if there is no lawsuit. The action is brought before the court at the request of the prosecuting party. The parties are summoned before the judge by registered letter with requesting acknowledgement at the instigation of the chief clerk of the court. Once the parties have been heard or duly summoned, the judge decides by making an order, which is not subject to appeal, except an appeal in case of default. An appeal must be lodged within the month of notification, which is sent by registered letter with a request of acknowledgement receipt. However, if the action is brought before the Presiding judge of the Supreme Court or before the First presiding judge of the High Court of Appeal, the parties will not be summoned nor will they be heard. They may, however, produce any written pleadings they think fit. Article 28 - The President of the Bar must show evidence: 1° of collective insurance covering the financial civil liability consequences for each member of the Bar in respect of any faults committed within or during their practice; 2° of collective insurance in favour of whoever may be concerned guaranteeing for each avocat-défenseur the reimbursement of funds and the restitution of stocks and shares received during their practice. The premiums related to such insurance policies, entered into on behalf of the Bar, are paid by the members of the Bar, who are obliged to pay their share of the premiums. The President of the Bar must give evidence of such insurances to the Public Prosecutor at the beginning of each court year. Article 29 - Avocats-défenseurs and avocats are under the supervision of the Public Prosecutor. The same is true for trainee lawyers. An additional punishment to the first three, which may also be pronounced, is the loss of the right to be part of the committee of the Bar during a maximum period of ten years,. When the sanction imposed on an avocat is a reprimand or suspension, the sanction shall also determine the time not exceeding five years during which the avocat may not be appointed as an avocat-défenseur. Any avocat-défenseur or avocat reprimanded or suspended is the last one to be registered on the roll of the Bar. Such additional measures will stop automatically after three years if there is no further disciplinary punishment imposed on the concerned party. Article 31 - Disciplinary punishment is pronounced in the chamber of the Court of Appeal to which the matter has been referred by the Public Prosecutor. However, where there is some offence committed in a hearing, the warning, reprimand or suspension may be pronounced by the court being referred to, subject to the option for such court to inform the Public Prosecutor of such offence. The warning or reprimand may also be pronounced by the committee of the Bar meeting as disciplinary committee and referred to by the Public Prosecutor, the President of the Bar or the aggrieved party. Article 32 - When proceedings are submitted to the Court of Appeal, the Public Prosecutor summons the party concerned to appear by registered letter that receipt be acknowledged after having received the recommendation of the Bar committee. The summons must mention the purpose of such proceedings. There shall be a period of at least fifteen days between the sending of the letter and the hearing date. The party concerned, who may be assisted by an avocat-défenseur or avocat of his choice, gives an explanation. The President of the Barеs comments are also heard. Judgment shall be issued at the date determined in the chamber of the Court of Appeal. If the party concerned has not appeared, he or she shall be informed of such date by registered letter requesting that receipt be acknowledged at the Public Prosecutorеs instigation. The judgment is not subject to appeal. The judgment may be subject to appeal on questions of law before the Supreme Court within five clear days as of its pronouncing. Such appeal and its delay have suspensive effect. Such appeal is considered as urgent pursuant to article 458 of the Monaco Civil Code of Procedure. Article 33 - When proceedings are submitted to the Bar, the procedure provided for by paragraph 1 to 3 of the preceding article shall apply. However, the registered letter will be sent by the appropriate court officer called the syndic rapporteur. The decision is subject to appeal by the Public Prosecutor or the party being punished. The appeal must be lodged within ten clear days from the decision being made and by way of declaration to the clerk of the court. The chief clerk of the court informs the president of the Bar immediately and if necessary the Public Prosecutor or the party concerned. Such appeal and its delay suspend the proceedings. The Court of Appeal decides in chamber, in accordance with the preceding article. Article 34 - The decision made by the appropriate court and deciding in disciplinary matters in case of some offence committed in a hearing is subject to the usual appeal. Article 35 - Any decision issued in disciplinary matters must be immediately forwarded, either by the President of the Bar to the Public Prosecutor or by the Public Prosecutor to the Directeur des Services judiciaires. As soon as the decision has become final, it is forwarded by the Public Prosecutor to the President of the Bar for the application of the provisions in the 2nd paragraph of article 30. Article 36 - Once the warning sanction has become final, the member of the Bar concerned is summoned at the instigation of the Public Prosecutor before the First presiding judge of the Court of Appeal to remind him of his duties. Once the reprimand sanction has become final, the party concerned is summoned at the instigation of the Public Prosecutor before the chamber of the Court of Appeal ordering him or her to be more dutiful and prudent in the future. Article 37 - In any of the cases where a suspension or disbarment has been pronounced, the effects of punishment are suspended until the Prince makes a final decision upon receiving a report from the Directeur des Services judiciaires. However, the party concerned must abstain from practising law as of the sanction being pronounced and until the Princeеs final decision. The President of the Bar shall take all steps he thinks fit to protect the interests of the partyеs clients concerned until the court has decided in accordance with article 40. Article 38 - If the suspension or disbarment sanction is upheld by the Prince, the member of the bar shall be convened at the instigation of the Public Prosecutor before the chamber of the Court of Appeal, the President of the Bar attending. He or she shall be notified of the measure imposed on him or her by the First presiding judge, who shall inform him or her, where applicable, that he or she must either abstain from practising law during the prescribed period or stop doing so definitively. The president of the Bar shall take the steps mentioned at the 2nd paragraph of article 37. Article 39 - Disciplinary proceedings do not prevent any further prosecution to which the member of the Bar may be liable. Once any prosecution is initiated, the party concerned may be forbidden by the Court of Appeal to practise law, such court deciding in chamber pursuant to the rules fixed in article 32 and ordering him or her to be replaced according to the conditions provided for by article 40. Article 40 - Should an avocat-défenseur be unable to practice law for reasons of physical incapacity or further to a disciplinary measure, the Court of First Instance may, in urgent cases and by way of temporary measure, order that he or she be replaced by an avocat-défenseur or, if none, by an avocat appointed by such court for this purpose. The Court is seised upon request of the Public Prosecutor and decides in accordance with the provisions of article 850 of the Monaco Code of Civil Procedure in matters of grace. The judgment determines the replacement period and may not be lifted, nor must it be served and is not subject to any appeal. The avocat-défenseur who has been replaced, the substitute and the President of the Bar are notified of such judgment by the chief clerk of the court by registered letter requesting that receipt be acknowledged. The order made may be extended or cancelled by a judgment issued in the same way. 4° the provisions regarding insurance effected by the President of the Bar on behalf of the Bar. Article 42 - The Order of 9 December 1913, Law n° 795 of 17 February 1966 and Law n° 823 of 23rd June 1967 as well as any provisions contrary to this law are repealed. However, the provisions of the Order of 9 December 1913, as modified, regarding the lawyersе training and appointment conditions shall continue to apply to trainee lawyers already registered under part 3 of the roll of the Bar on the date of publication of this law. Article 43 - The committee of the Bar in practice upon publication of this law shall remain in office until the beginning of the next court year. Article 1 - Any candidate for the training programme, which is required by article 1 number 6 of Law n° 1047 of 28 July 1982 to be admitted to practise law, must comply with the conditions provided for by numbers 1 to 3 of the said article of that law and with the condition provided for by article 1 number 5, unless exempt pursuant to article 2 of the law; according to number 4 of the law, he or she must also be the holder of either a French master of law degree diploma issued by a French University of Law or of a similar diploma recognised by the committee composed as set out in article 2 hereinafter. The holder of a law degree issued before 1st June 1954 is considered similar to the holder of a master of law degree. The same is true for law graduates who received their law degree when this covered four years of study at a University of law. - the Head of National Education, Youth and Sport. Should there be an equal number of votes, the chairman shall have the casting vote. If necessary, the operating conditions of the committee shall be fixed by an order of the Directeur des Services judiciaires. Article 3 - The training admission examination referred to in article 3 of Law n° 1047 of 28 July 1982 includes written and oral admission tests. 2° a law test on either an issue regarding Monegasque civil law or civil procedure or comment on a judgment given by a Monegasque court, lasting three hours. 3° a presentation, lasting 10 minutes after one hourеs preparation, followed by a discussion with the examining board on a subject to test the candidateеs general knowledge and his or her ability to express himself or herself orally. Article 6 - Each written or oral test receives a mark from 0 to 20. Any mark below 5 counts as a fail. The oral presentation provided for by article 5.3 receives a rate equal to 300 percent. The candidate will only be admitted if he or she has received a general average mark of 10 for the written examinations. Such admission is only valid for any examination during which it has been achieved. The candidate will only be admitted if he has received a total of 60 points for oral tests. Article 7 - The admission examination is organised during the last quarter of the calendar year. The date of the tests will be fixed by an order of the Directeur des Services judiciaires. According to the circumstances, an additional examination may be organised during the second quarter of the calendar year. The judge of the Court of Appeal will be the chairman of the examination board. Article 9 - At the end of the examination, after having established that the candidate has passed and may be admitted to the training programme in accordance with the conditions provided for in this chapter, the examination board draws up the minutes which are signed by each of the members and forwarded to the Directeur des Services judiciaires. Article 10 - The candidate being admitted to practise as a trainee lawyer in accordance with the second paragraph of article 3 of Law n° 1047 of 28 July 1982 shall take the oath provided for by article 9 of the said law and be registered on the list of trainee lawyers. The taking of the oath must take place within two months of the publication of the order of the Directeur des Services judiciaires. 4° he or she must steadily follow any lectures and training at the courts as defined under sections 1 and 2 of this chapter. - the Directeur du contentieux et des études legislatives or his or her representative. Article 13 - Lectures given by the president of the Bar or his or her representative deal with the rules of the practice as avocats-défenseurs or avocats, ethics, the preparing of files, the writing of pleadings and the techniques of lawyersе addresses to the court. Article 14 - Lectures given by the judges deal with private law. They include general presentations on the rules regarding the main subjects of private law and must highlight the distinctive features of Monegasque legislation and case law especially compared with French legislation and case law. The judges in charge of such lectures are appointed by the Directeur des Services judiciaires upon recommendation by the heads of the courts or the Public Prosecutor as the case may be. The specific qualification of the appointed judge with regard to the legal subject dealt with is taken into account. Article 15 - Lectures given by the Directeur du contentieux et des études legislatives or by his or her representative deal with public law. They deal especially with constitutional principles as well as the rules of jurisdiction of the Supreme Court, the procedure to be applied and the main judgments in case law issued in constitutional and administrative matters. Article 16 - Each person responsible for training as mentioned in article 12 has the option to deal with any subject defined under articles 13, 14 and 15 once it has been agreed with the person usually in charge under the said articles. He or she may also be assisted or replaced by any qualified person, once authorised by the Directeur des Services judiciaires. Article 17 - An order of the Directeur des Services judiciaires determines the number of lectures to be given within a quarter. The date and hour of the lectures is fixed by the person in charge of them and forwarded to the trainee lawyer. Article 18 - At the end of the training programme, the circumstances relating to how the trainee lawyer has followed the lectures, especially regular attendance, are the object of opinions given by the President of the Bar, the heads of the courts, the Public Prosecutor and the Directeur du contentieux et des études legislatives for each of the persons concerned. Such opinions will be forwarded to the Directeur des Services judiciaires. Article 19 - The lectures referred to in articles 14 and 15 may be attended by civil servants from the office of the Directeur des Services judiciaires with his authorisation or by civil servants from other administrative offices with the authorisation of their head of office. The Directeur des Services judiciaires may also authorise other persons than civil servants, the activity of whom justifies such attendance, to attend such lectures. Article 20 - During the last six quarters of training, the trainee lawyer is obliged to follow the works of various courts and of the office of the Public Prosecutor for periods of time not exceeding two months for each training period and according to the conditions defined by the heads of the courts and the Public Prosecutor respectively. Training must take place in particular with the justice of the peace, at the court of first instance, the court of appeal, the arbitration committee and the office of the Public Prosecutor. Article 21 - At the end of each training session, the trainee lawyer will write a report summarising his or her activity at the court concerned. Such report will be forwarded to the head of this court. Article 22 - The heads of the courts and the Public Prosecutor will forward the opinion provided for by article 18 to the Directeur des Services judiciaires, together with training reports and their related comments. Article 23 - Once the trainee lawyer is admitted to practice as a lawyer, he will be registered on the roll of the Bar of avocats-défenseurs and avocats. Otherwise, he or she will be deleted from such roll. Article 24 - Should the training period be extended for a one year period or for two periods of one year pursuant to article 4 number 1 of Law n° 1047 of 28 July 1982, the decision of the director may specify the kind of lectures or training at the courts which are again to be followed by the trainee lawyer. Article 25 - The committee of the Bar is composed of the President of the Bar, a reporter (syndic-rapporteur) and a treasurer (syndic-trésorier). They are elected by the avocats-défenseurs and avocats convened in this respect by the President of the Bar in practice and at a general meeting held in the room of the Bar at the Law Courts within at latest the month following the start after court vacation. First, there is the election of the President of the Bar, who must be chosen amongst the avocats-défenseurs having practised for ten years from their registration on the second part of the roll. Then follows the election of the reporter (syndic-rapporteur) and the treasurer (secrétaire-trésorier), one of whom must be an avocat-défenseur. Any member of the Bar belonging to the two first parts of the roll is eligible provided that he or she complies with the conditions set out in the preceding paragraph. The election of each member of the committee of the Bar is preceded by the candidates being called, which must occur before the beginning of the meeting. The meeting gives the name of the candidates being proposed. If there is no candidate, each member of the Bar belonging to the two first parts of the roll can be appointed. Election takes place in accordance with the conditions fixed in article 11 paragraphs 4 and 5 of the above mentioned law. In case of a vacancy in the course of the year, a successor will be elected within the month of the date of vacancy for the remaining period of office in accordance with the conditions provided for by this article. Article 26 - The committee may only deliberate if it comprised at least two members. If the votes are equal, the chairman has the casting vote. The President of the Bar convenes the committee at least once a year and also each time he or she thinks fit or upon reasoned request of a member of the committee. He or she convenes and presides over the committee meetings. The reporter (syndic-rapporteur) is the prosecuting party against the avocats-défenseurs and avocats before the committee. He or she is heard prior to any resolutions of the committee being obliged to decide on his or her requests. He or she has the right to convene the committee just as the President of the Bar, but only after having informed the latter. He or she guarantees the execution of the resolutions. In his or her capacity as a reporter, he or she gathers any useful information about avocats-défenseurs and avocats and reports it to the committee of the Bar. The treasurer (syndic-trésorier) manages the funds required for the operating of the Bar. He or she draws up the minutes of the meetings and keeps them in the records. Article 27 - Any resolution of the committee of the Bar and of the general meetings is reasoned and signed in the original minutes by all the members attending. Certified copies are signed by the secretary. Registers of the resolutions are forwarded to the Public Prosecutor. Article 28 - Avocats-défenseurs and avocats must actually practise law in the Principality of Monaco. They are obliged to have an office in order to perform their functions with dignity required by the practice of that profession. Article 29 - Avocats-défenseurs or failing whom avocats must come within the jurisdiction of the courts or replace the judges as provided for by the law. They are called to be part of the legal aid office. Article 30 - At any hearings the avocats-défenseurs and avocats must wear their black woollen gown closed in the front with wide sleeves rolled up, and a black woollen cloak over their left shoulder, with a line of white fur at the ends, a white hanging pleated tie and a black woollen hat, which is optional. Article 31 - Avocats-défenseurs and avocats stand up while addressing to court (final pleadings). They must take off their hat to read the pleadings and exhibits. They also stand up without their hat whilst the judges pronounce their decision. Article 32 - Once the avocats-défenseurs and avocats have started defending one party, they cannot be in charge of the defence of the other party or of his or her legal successors without the formerеs approval. Article 33 - If during the lawsuit an avocat-défenseur or avocat is sick or otherwise held up, he or she shall inform the presiding judge of the court referred to as well as his or her client in writing and in case of emergency be replaced by another avocat-défenseur or avocat without prejudice to the provisions of article 40 of the above mentioned law. Once a substitute has been appointed, he or she shall plead the case in court unless postponed to a further hearing date. Article 34 - If an avocat-défenseur or avocat neglects the defence of his or her client, in particular by failing to attend a hearing, and does not take into account the order of the presiding judge of the court referred to, he or she will liable to disciplinary punishment without prejudice to reimbursement of costs caused by his or her delay. The same is true for any avocat-défenseur or avocat who does not comply with the order of the Public Prosecutor further to the claim of a client. Article 35 - The lawyer is obliged to follow the case of which he is in charge until final judgment is given. He or she has the right to hand over the case if he or she thinks fit provided the client has been informed sufficiently in advance in order to choose another lawyer. Article 36 - Avocats-défenseurs and avocats are appointed in turn in accordance with the provisions of the Monaco codes of civil procedure and of penal procedure in order to assume representation and defence of legal aid parties. They may only refuse their services if they show legitimate reasons. If the reasons put forward are admitted, other avocats-défenseurs or avocats will be appointed. Otherwise they must comply with their obligation. Article 37 - During any court recess, the committee of the Bar makes sure that in criminal matters the defence of those who have asked for a lawyer appointed by the court be dealt with as provided for by the provisions of the Monaco code of penal procedure. Article 38 - The title of honorary avocat-défenseur or of honorary avocat may be granted by the Prince to the avocats-défenseurs and avocats who have not practised for more than twenty consecutive years, pursuant to the report of the Directeur des Services judiciaires, who will take and attach the opinions of the First presiding judge and of the Public Prosecutor. Honorary avocats-défenseurs or honorary avocats have the right to attend the general meetings of the committee of the Bar. They have consultative voice. Article 39 - The insurances provided for by article 28 of the above mentioned law must include a cover in an amount at least equal to five million French francs a year for each member of the Bar. This figure may however be reduced to FF 600,000 for theft risk and to FF 240,000 for the destruction of archives. The first loss payable by each member of the Bar who is beneficiary of the insurance cannot exceed 10% of the indemnity due. Article 40 - The professional risks insurance mentioned at article [ ] number 2 of the above mentioned law applies when an avocat-défenseur does not pay funds or does not give the stocks and shares he or she received from a client while practising law. The obligation of the insurer results from a request to pay or to make restitution if the request has been refused or has been ineffective during a period of one month from service of such request and if it has been proved that the debt is due for immediate payment. The writer of the request and the avocat-défenseur inform immediately the President of the Bar of the said request. Article 41 - Any avocat-défenseur, avocat or trainee lawyer, who is subject to an action before the court because of his or her professional activity must inform the President of the Bar of such action. Article 42 - Proof of insurance to be given by the President of the Bar pursuant to article 28 of the above mentioned law must be forwarded to the Public Prosecutor the first time within three months from publication of this order. Article 43 - Sovereign Orders n° 3212 of 23rd April 1946, n° 1107 of 25 March 1955, n° 3012 of 12 July 1963 and n° 3593 of 8 June 1966 as well as any provisions of this order to the contrary are repealed. Article 1 - Avocats-défenseurs, avocats and trainee lawyers giving legal aid assistance and appointed by the court are granted compensation by the State. Article 2 - Such compensation is fixed according to a value unit (VU) and to multiplying factors. The amount of the value unit and the multiplying factors are fixed by an order of the Directeur des Services judiciaires. Article 3 - At the end of each procedure, the main chief of the clerk issues an attestation confirming the end of the case, which is duly signed by the appointed avocat-défenseur, avocat or trainee lawyer, which he or she forwards to the trésorier des finances*** for payment. Article 3 - Should difficulties arise, they shall be settled as provided for in article 27 of Law n° 1.407 of 28 July 1982 on the practice as avocats-défenseurs and avocats, in case of non reconciliation. Article 4 - The provisions of this order apply to appointments in respect of legal aid and in respect of officially appointed lawyers between the 1st January and 31st December 2003. The provisions of Our Order n° 15.617 of 27 December 2002 fixing payment conditions to avocats-défenseurs, avocats and trainee lawyers giving legal aid assistance and appointed by the court are renewed for a period of six months from 1st January 2004. The provisions of Our Order n° 16.123 of 6 January 2004 fixing payment conditions to avocats-défenseurs, avocats and trainee lawyers giving legal aid assistance and appointed by the court are renewed for a period of six months from 1st July 2004.